Wyllie Tiles are a family owned and run business with several stores throughout Tasmania. The design brief was simple; design and build a solar power system that will reduce their power bill and inturn reduce overheads, to strengthen the already strong position in the industry and set us up for the future. Wyllie Tiles were clearly looking into the future and were serious about investing big to realise that vision. 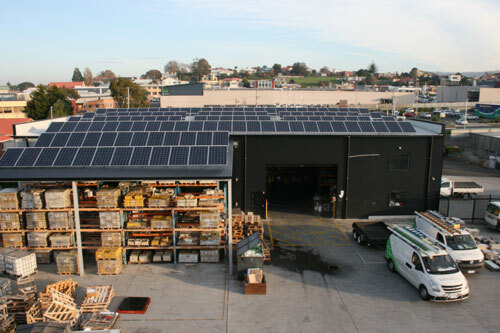 After discussing and understanding how the stores operated and each stores power usage, a two-stage master plan to fit all stores with solar power began with the Devonport store. Panels were fitted on the roof and tilted up to 25 deg to pick up more winter sun to compliment the load profile that had high demand during winter days due to electric heating. Gaps were designed into the layout to allow natural sunlight to come into the warehouse through the existing lazerlite. The system comprised of 120x 250W REC solar modules and 2x SMA STP15000TL inverters. REC panels were chosen to provide high energy yields due to their fully automated manufacturing techniques and no compromise Norwegian design. SMA was chosen as the inverter supplier for their premium quality, remote monitoring capability, and after- sales service. 2x STP15000TL inverters were chosen to provide a redundant system that was not reliant on 1 inverter. The Sunlock Australian made mounting system was chosen for the project due to its high quality components that provide a stringent engineered solution. We estimated that the system would produce around 40,515 kWh per year in power generation. The system was commissioned on the 27th May 2013 and to date has made 43,865 kWh of power. Our clients last 2 bills have been in credit so they are incredibly happy with the performance of the system. The system has exceeded all expectations and given our client confidence to start the process with their other sites. Wyllie Tiles being a highly regarded Tasmanian owned and operated company have set a new standard in regards to energy efficiency and future proofing their company.